Once upon a time , the Portuguese came on their sailed ships called Caravelas , and discovered the land we now call Goa. Enter then the sea facing dining called " Caravela' at Taj Holiday Village Resort & Spa, situated in Sinquerim , and the first thing I see are the many speed boats and yachts on the sea, they even have parasiling boats with colourful parasails floating behind them . The Sunday brunch boasts of a menu which takes inspiration from a number of world cuisines , but what really blows ones mind is the world class view from the deck , as well as the silhouette of the Fort Aguada in the not so distant. The Taj Holiday Village,Goa property in itself is a very verdant and picturesque surrounding, and add to that the fact that it is situated so close to a fort as well as a beach , makes it the perfect one stop tourist destination for many. 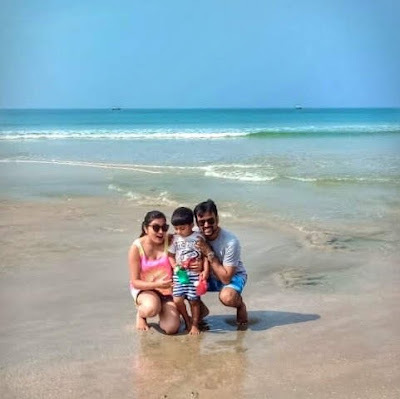 For us it was more of a Sunday morning spend, but that too, we had the option of walking to a fort, or frolicking on the beach, or enjoy a dip in the resort pool. Here is a look at the brunch at Caravela Taj Holiday Village Resort & Spa , in pictures , also some nifty tips on turning a buffet brunch into a coursed meal. all it takes is some ingenuity, tips at the end of the blog. make your own DIY cheese platter is one of the first things I do at a buffet brunch, with so many cheeses and cold cuts to choose from, it makes for a colourful and healthy platter of nibbles for the entire table. try it next time you go brunching. Another is creating a mezze platter and since the buffet had hummus and flat breads, its another platter of food you can easily recreate at almost any brunch. Brunches I believe should be for communal and family eating. This is the platter I made for my mom who was visiting us, as the resident food blogger , I decided to curate a plate of Goan delicacies for her, and here we have the local Goan ried rice, pork Vindaloo with pickled onions and cherry tomatoes, few choice breads, a salad, and Bebinca for dessert. The family that dines together, stays together. The chefs special coriander prawns is a Goan inspired dish, bu with no use of coconut or the quintessential Goan masalas, this one had hung curd, besan, and coriander leaves as it's base, and as mom said, tasted like punjabi Kadhi, or a burmese khou suy , haha , goes to show that food is an extremely individual taste. single serving salads, they were so pretty I had three of each, dont mind me, but I love my salads. The Italian spread had my favourite Zuchchini parmegianno, a dish which reminds me of great Italian home cooks and TV shows I love. a nifty trick to brunching with toddlers, start them of with something crunchy like a papad, and some finger food, it gives you time to scope out what else they might be interested in, even t=if the temeptation is huge, dont start with sugars. SHreyu with his favourite , watermelon juice. My favourite dessert from the dessert platter, the lemon cream tart. Thankyou to the entire child friendly staff, including executive chef for not minding the ever inquisitive toddler. colourful desserts , i love mine brown though , chocolate desserts are my weakness. so as promised here are a few ways of enhancing your buffet brunch experience at ANY brunch you go. 1. think of it as communal meal, try and bring platters which the entire family can tuck into, rather than single plates of food, pile one high with biryani, a few kebabs and lo presto you have a shareable meal at your table. 2. create your own cheese platter with the cheeses, cold cuts, salads , and fruits, and again make it a big platter, every one can nibble from at your table. 3. pair different cuisines together, and make small plated meals fromeveryone at your table, borrow a jug and pour the juices on offer into it so that you are not going to the buffet counter again and again. 4. dessert platters for sharing are a great way to try everything at the buffet offering as well as have everyone share from single servings, thus not wasting food.